Click the button below to add the Alpaca Blend Tam One Size Adult Assorted Colors and Patterns to your wish list. Fun, fashionable alpaca tam keeps you warm and looking good. These tams are handcrafted by the Huarcaya family in our workshop in Lima. We uses only 50% alpaca and 50% acrylic yarn. One size in adult fit. One pair hand knit beret hats super warm and light. 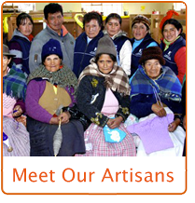 Artisan made Fair Trade pack of two from Peru. Set of 2 assorted colors geometric patterns in one size fits most. Hand washable 50% natural alpaca yarn 50% acrylic. Purchase two assorted and save a bunch from retail.